Newswire #83 – 3rd August 2016. Your latest news direct from Anime Limited HQ on AllTheAnime and Funimation titles coming to the UK. It was a big weekend for Anime Limited this past weekend as we had some big news to share at the MCM Manchester Comic Con and Amecon events. If you weren’t at either it’s time to bring you up to speed on what we announced over the weekend, and bring you the latest on Funimation titles as well. ~ First of all, a big thanks to everyone who came to our stalls and panels at MCM Manchester Comic Con and Amecon past weekend. It was great to speak to so many of you over the weekend. We had a great time at both shows. For those wondering what our next event will be, it will be MCM Scotland Comic Con in Glasgow at the end of September. We’ll have details on what to expect from us at the event we get closer to it. Stay tuned accordingly. 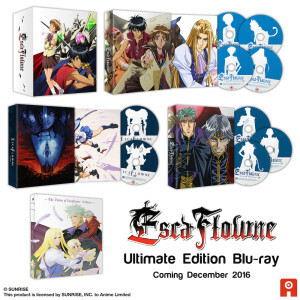 Escaflowne Ultimate Edition details revealed! Perhaps the biggest news we shared over the weekend was what we have planned for our Ultimate Edition set of Escaflowne, due for release in December. You can read all about this in great detail HERE, but the short version is there’s a heck of a lot we’re including in our release including the 3-disc original soundtrack by Yoko Kanno! We’re also having an Early-Bird Pre-Order special offer on this at our web shop! CLICK HERE for the details. The next piece of news is that we’re going to be releasing the short film from Production I.G, Pigtails. This 30 minute short is an adaptation of a manga that won the New Artist Prize art the 18th Annual Osamu Tezuka Cultural Prizes in 2014. The story is set in the aftermath of the 2011 Tohoku earthquake and ensuing nuclear disaster. The original manga by Machiko Kyo was a reflection of her personal feelings towards the events that happened in March of 2011. The short is directed by Yoshimi Itazu, who has previously worked on the likes of Miss Hokusai as character designer and supervising animator, and was also key animator on Hayao Miyazaki’s The Wind Rises. This is his directorial debut and we’re delighted to be able to bring this to the UK as part of a collection of short films from Production I.G that will also include Kick-Heart and Oval x Over. It should also be noted Oval x Over has never been released outside of Japan. You can watch a trailer for Pigtails this below. It’s also worth noting that some of these shorts will be getting screened at the Scotland Loves Anime film festival in October – stay tuned for details on that as we can bring it. And the final announcement is that we are bringing the classic series Ouran High School Host Club to Blu-ray for the first-time in the UK as a Limited Collector’s Edition set later this year! There will be more details to follow soon. Expect more details on this in the coming months on each of the above. To give you a breakdown of what’s included, the entire release comes packed in a rigid case. Inside that will be a digipack to hold the two discs, 1 x Blu-ray + 1 x DVD, and you’ll also find a 32-page booklet packed full of content. On-disc extras (exclusive to the Blu-ray disc only) are a U.S. Cast & Staff Commentary and Japanese trailer for the film. This will be getting released on Monday 5th September. We will note that this date is different to what’s being listed elsewhere, and will be reflected with online retailers shortly. The reason for the date change is a delay in the BBFC certification of the film. Some of you might be wondering why this needs to be certified when it already had been it’s UK Premiere last October at the Scotland Loves Anime Film Festival. The simple reason being that theatrical certification and home video release certification are two entirely different things. So film has to be certified for release on home video specifically. 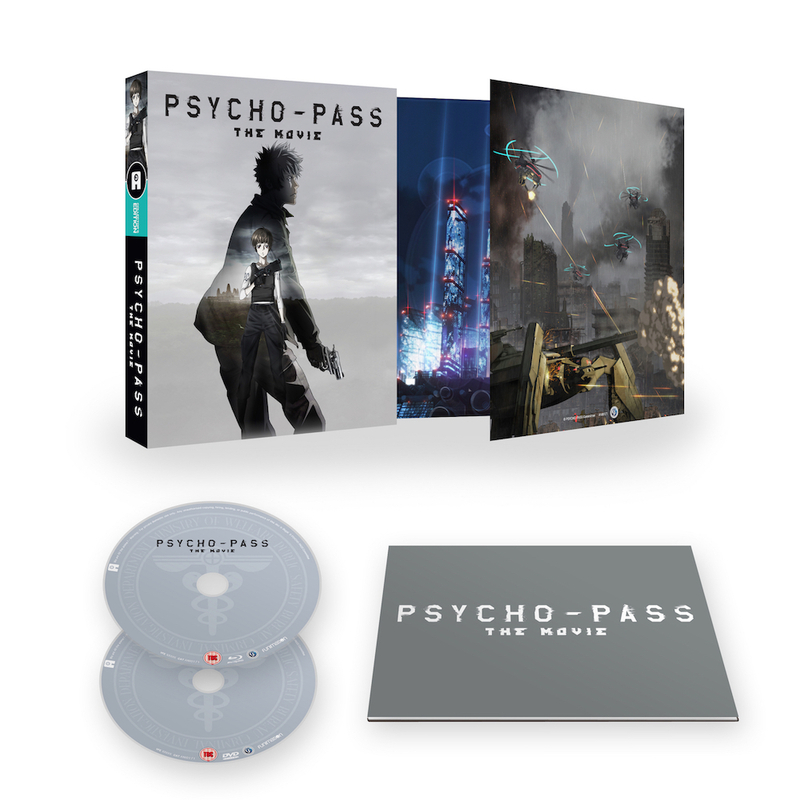 You can pre-order your copy of Psycho-Pass The Movie today from the likes of Amazon UK, Zavvi, Base, Anime-on-Line and our own web shop now. ~ You can check out the trailer for Psycho-Pass The Movie below. Following the same style as Part 1, our release of Part 2 will come packed in a rigid case to store the digipack that holds the two Blu-ray discs, and there’ll also be a 20-page art booklet in there too. On disc extras are the the second Clean Opening and Closing title sequences. And best of all you won’t have to wait too long for it either. It’s being released on Monday 5th September. Expect to start seeing listings with online retailers for this soon. 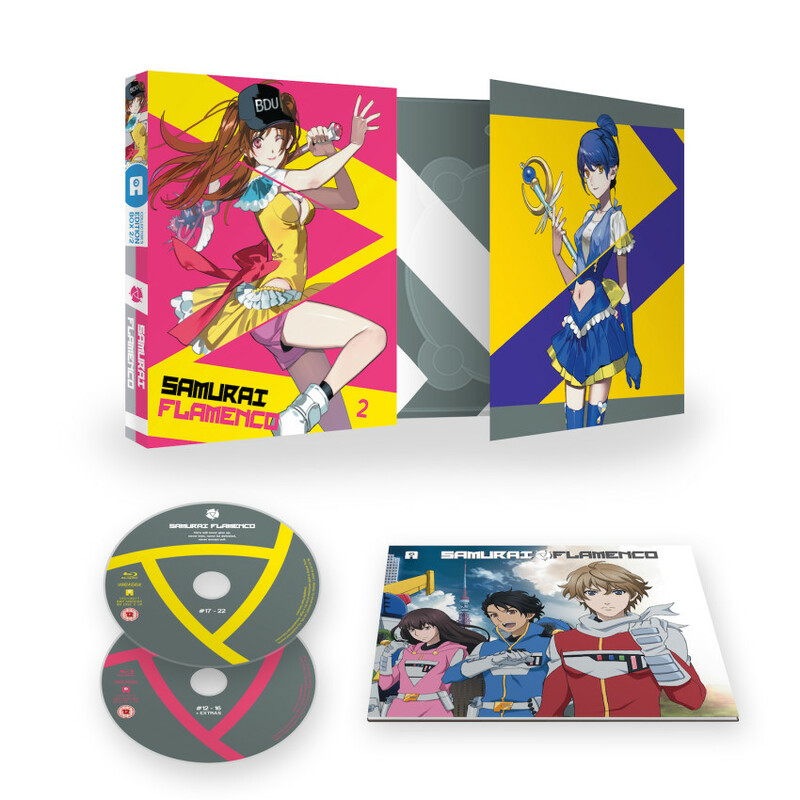 Until Tuesday 9th August pre-order Samurai Flamenco Part 2 for only £24.99. Details at our web shop HERE. ~ Looking ahead to the fourth quarter of the year, we want to give you a preview of our lineup of releases slated to arrive between October and December. Though we want to stress now that the dates being listed below are tentative and are NOT FINAL. I will add that there are likely more additions to be added to the above list, such as our Escaflowne Ultimate Edition which we’ve tentatively slated for December. So this list is by no means final and there will be more details on each in the coming weeks and months. ~ For those of you who pre-ordered Mobile Suit Gundam Thunderbolt from our web shop, we’re happy to confirm that these are being shipped this week. We’ve had people asking if there will be any chance of units being available in the future? While we can’t say for sure at the moment, we will say that if we do have the opportunity to take orders for more we’ll be sure to make it known. ~ Just one piece of you news to bring relating to Funimation titles this week. This being that due delays in BBFC certification, which is required by UK law, the release dates for Gonna Be The Twin-Tail! !, Fairy Tail Part 10 and No-Rin will be getting amended. We noted last week about the delay to Gonna Be The Twin-Tail! !, unfortunately the delay in certification has meant this will now likely not be arriving until the end of August at the earliest. As we mentioned last week, once we have a new locked in date we’ll be sure to make it known. When it comes to Fairy Tail Part 10 and No-Rin, we’re working the basis that neither will be arriving before September. Chances are by the time you’re reading this dates may have started shifted with retailer listings. Please note that these new dates being listed are NOT final, they are simply placeholders. Once we have the new locked in dates we’ll be sure to make them known ASAP. We’re sorry for the delay in all three of these. But to confirm, the next Funimation title release will be Gonna Be The Twin-Tail!! and as soon as we have the new date locked we’ll be sure to make it known. ~ A quick reminder that if you haven’t got your copy already, Yona of the Dawn Part 1 is available now. Check out the trailer below. And with that being said, that wraps up this edition of the Newswire.